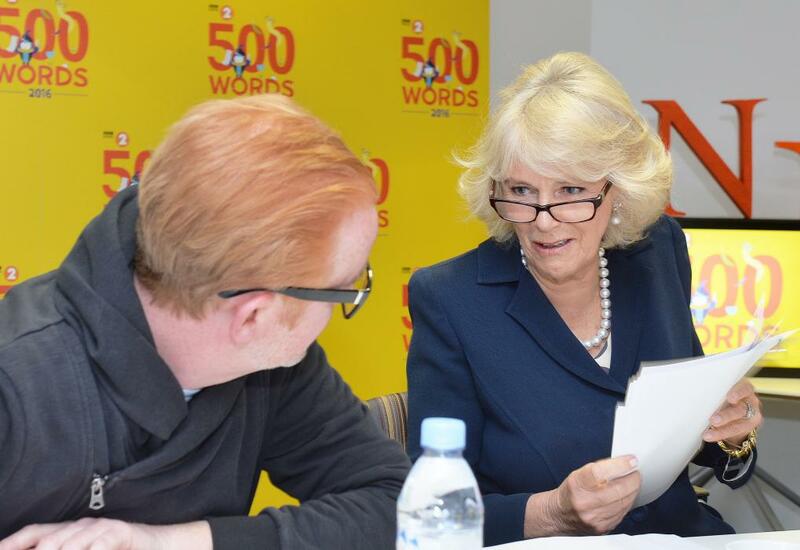 The Duchess of Cornwall joined the judging panel as an Honorary Judge for BBC Radio 2's 500 Words creative writing competition today. Her Royal Highness arrived at Western House in London, home to the BBC Radio 2 studios, and was greeted by Lord Hall, Director-General of the BBC and Bob Shennan, Controller, Radio 2. The Duchess’s visit began at the BBC Radio 2's Breakfast Show studio where Chris Evans introduced Her Royal Highness to some of his guests from the morning show, including actor Tom Hiddleston and actresses Sophie Turner and Helen George, and members of the pop group Dexy's Midnight Runners. After meeting with members of the production team, The Duchess was introduced to the other members of the 500 Words judging panel: Malorie Blackman, Frank Cottrell Boyce, Francesca Simon and Charlie Higson. The judging panel then settled down to discuss the 50 shortlisted stories from the 123,436 entries submitted to the competition. The Bronze, Silver and Gold winners in the two age categories, 5 – 9 year olds and 10 – 13 year olds, will be announced during a live broadcast of the Chris Evans Breakfast Show at the Shakespeare’s Globe later this month. The event will be an extravaganza of live music and readings of the winning stories by a group of handpicked celebrities. Judging for this year’s #500words competition is well underway. The Duchess is here at the BBC Studios alongside her fellow #500words judges which include Chris Evans and Horrid Henry author Francesca Simon. The 500 Words competition asks children aged 13 and under, up and down the UK, to put pen to paper and compose an original work of fiction using no more than 500 words. Since its inception six years ago, the competition has received over half a million entries (over 270 million words) from children around the UK. The Duchess of Cornwall is an avid reader herself, and is passionate about literacy and about getting children and adults alike interested in reading and writing. Her Royal Highness is Patron of a number of literacy charities including the National Literacy Trust, BookTrust, Beanstalk and First Story.